From Budapest, Hungary now lives in Glasgow. Multinational experience in strategic brand management, working on local and global brands, launching new to the world brands, building brands from commodities, marketing mainstream, premium and luxury brands, using wide range of marketing mix elements. Given that we seem to be at the high baroque stage of the great gin renaissance with new gins coming out every week or so we thought it would be interesting to pick Iby’s brains about just how you go about launching and building a gin brand in the current highly competitive environment. 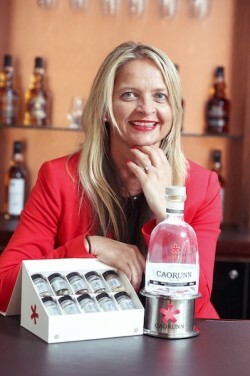 Caorunn is owned by International Beverage Holding who have a wide ranging portfolio of brown spirits and beers, what was behind the decision to launch a gin? The whole idea came together almost organically at exactly the right time and in the right place, just a minute before the craft gin boom started. Also we didn’t have to make a massive investment. Simon Buley, our Gin Master, was the deputy distillery manager of Balmenach on Speyside one of five whisky distilleries owned by the company. He had always been a gin aficionado and played with the idea of producing a gin using locally foraged ingredients that he found growing near the distillery. At the same time we discovered that Inver House Distillers had had a Copper Berry Chamber ever since the 1980’s and it hadn’t been used at all. It was decided to use it to make the gin at a distillery we already owned and that’s how the story started. What were the challenges involved in creating a recipe and making it different from anything else on the market? The recipe was developed 8 years before the massive penetration of small batch and craft gins so we were ahead of the game in terms of having much more freedom to innovate and make something different. We knew what we wanted and that was a flavour that would be distinctive but versatile and would work equally well in all the classic gin drinks. After a great deal of experimentation Simon arrived at the botanical recipe for our gin, a blend of traditional gin botanicals and local ingredients some of which like rowan berries, Coul Blush apple and bog myrtle had never been used in gin. We had a clear strategy as to what market, consumer and consumption occasion we would like to target and what brands we wanted to benchmark, but we didn’t want to be a copycat. So using locally foraged botanicals and a rare distillation method in the Copper Berry Chamber made a real point of difference from the start. We were clear about the bespoke red apple perfect serve, but also wanted to make sure that Caorunn G&T tastes equally well with generic garnishes. How helpful has it been to be part of an international spirits group with well established distribution? Being part of an established whisky company and using economies of scale did help, but we still had challenges. We are nowhere near the three big players in financial and human resources. We have good relationships with our existing importers/distributors and other trade partners who obviously had positive experience with the company; they were reassured by our credibility and solid financial background. On the other hand in most markets our whisky importers were already working with other gin brands, so we also had to find new partners, which was equally challenging and an issue that brands without an established network would have to face too. What are the difficulties of getting Caorunn into the booming gin markets of the US and Spain? We don’t concentrate on Spain because it is too saturated already. The US is enormous, it is not one market; it consists of 50 states with different legal environments, market characteristics and consumer behaviour. Talking about the US as one market is like talking about Europe as one market. For example on a very basic level because of different legislation you can do sampling in the East Coast but not on the West Coast. A very focused approach seems to work, but competition is heavy. In the US there is a lot of loyalty to local craft distillers. Import brands have to offer something genuine and unique to compete with local brands. Provenance has become hugely important and our Scottish proposition is strong but ultimately it is all about taste and a compelling story. Exporting requires investment, it’s not enough to put your brand on the shelf, there’s a lot of competition out there. Which part of your marketing strategy has been the most effective? Strategic communications, clear market and consumer segmentation, focused approach, gradual availability supported by pull activities are the most effective. Listening to bartenders, industry experts and understanding the on-trade trends helped us to create enthusiasm among industry opinion leaders. Trade education is a must for all brands no matter what level they are at. And one has to continually invest in and maintain these trade relationships because if the trade is not aware of the particular nature of your product they can’t sell it. A gradual launch into the off-trade channel has helped us to secure enough resources to support listings by push and pull activation. Our package design has also been extremely effective in helping us stand out from the crowd. Who is the typical Caorunn consumer? Our consumer is a connoisseur consumer typically 25-45 Y.O, urban male and female gin drinkers who are highly educated and have above average income. They work hard, but they also enjoy life. They are highly active socially. They are the opinion leaders, influencers, trendsetters. They are sophisticated, have a cosmopolitan outlook and like to eat out in restaurants, go to the theatre and cinema and make the most of culture and nightlife. Without giving too much away, have you any advice to give to anyone else thinking of launching a gin brand? Trust the 20/80 rule that is 20% of your customers will deliver 80% of your volume. It’s important to love them and build great relationship with them. Know your target audience: who they are, what they drink, where they drink, how they live their life, what will make them fall in love with your brand. Be consistent, stay true to your brand proposition all the time. How do you see the gin market in 5 years time, is this current boom sustainable? Gin is very saturated and I would think the market will consolidate and only the fittest will survive. I think the UK craft market will become like the US craft market in that each brand will find its own level. Those who have developed a fantastic product and built brand equity will succeed.